Widespread use of the swimmer’s snorkel is relatively new. I remember using a snorkel in my childhood while playing in the water with my friends. That kind of snorkel was attached to the side of a diving mask and was made for diving and not swimming. 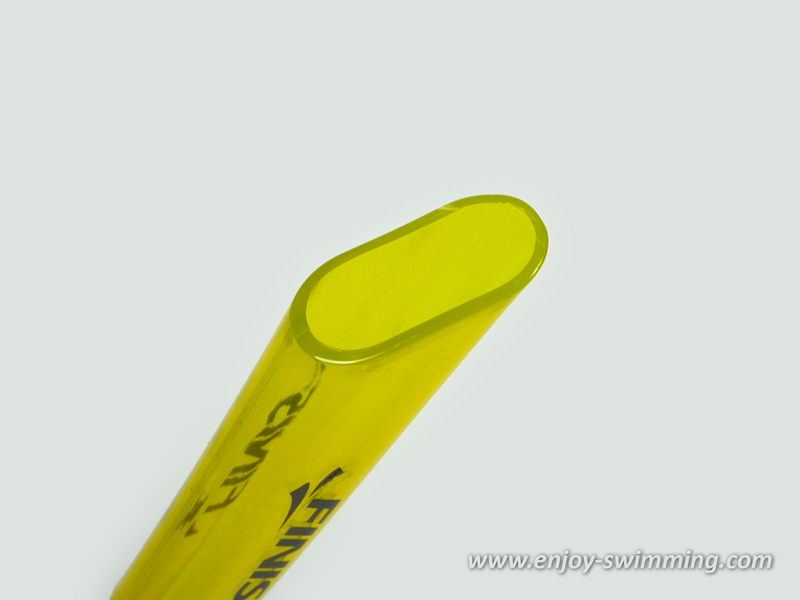 A few years ago Finis improved the snorkel’s design to make it usable for swimmers. 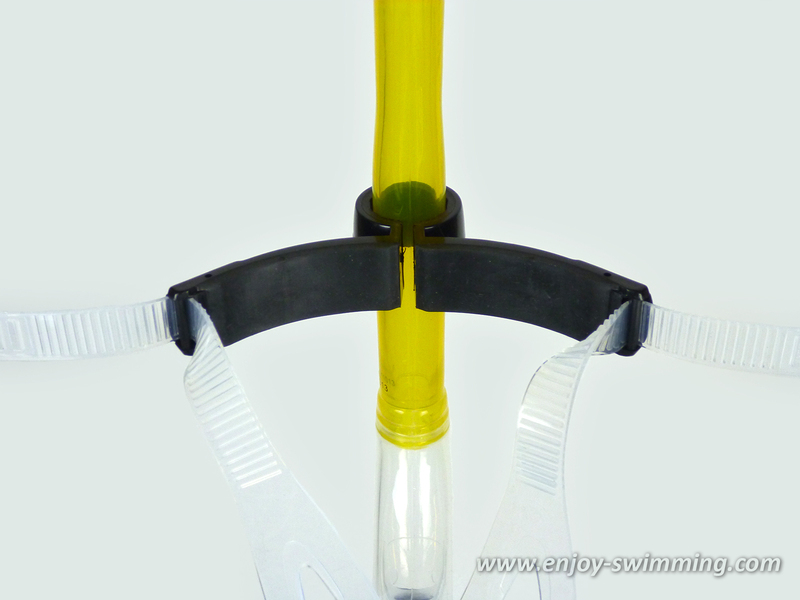 This new design is center-mount and can be used with any kind of swimming goggles. A mouthpiece made of soft transparent silicone, which rests comfortably in the mouth. The mouthpiece features a purge valve at the bottom. At the top, it attaches to the breathing tube. A stiff breathing tube made of PVC. It angles backward at the middle of the tube. It has a round profile at the base then morphs into a rounded rectangle towards the top. A head bracket. The middle part of the bracket wraps around the tube, keeping everything in place. The bracket ends in two curved branches that rest against the forehead. An adjustable strap made of the same transparent silicone as the mouthpiece. The strap attaches at both ends of the head bracket and is adjustable. At each side of the bracket, a small button locks and unlocks the strap for adjustment. Put on the swim cap. Put on the swim goggles. Put the mouthpiece of the snorkel in your mouth and gently bite on it. Pull the strap backward so the head bracket gets pushed against your forehead. You may have to slide the bracket up or down on the tube until the bracket correctly rests across the middle of your forehead. Pull the strap farther backward and downward around the back of your head. You may have to adjust the strap’s length so it fits correctly. 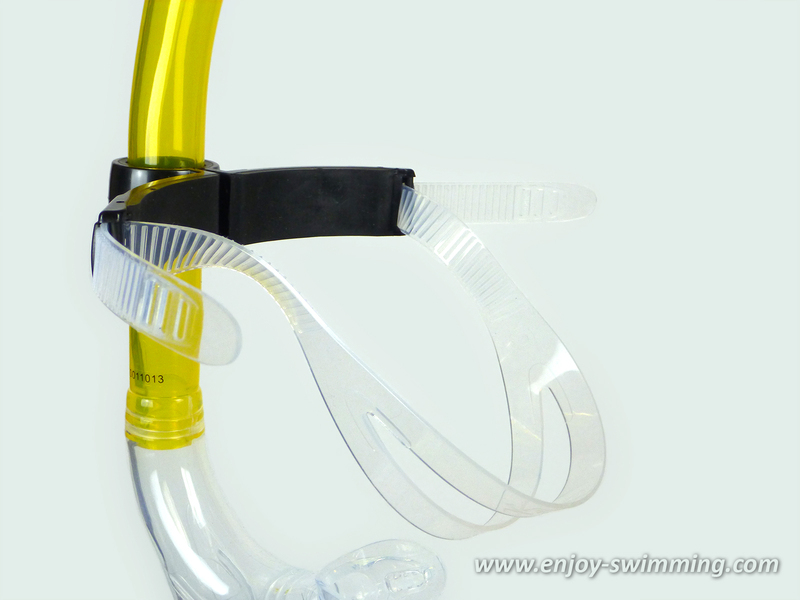 The swimmer’s snorkel should be used with a horizontal body position, face turned downwards. I position the head so as to look down and slightly forward. This ensures that the top of the tube is upright and stays above the water surface. Being able to breathe freely underwater can be disconcerting at first, but you get used to it quickly. Breathing is slightly constrained due to the length of the tube, but in practice, this isn’t a problem. If water gets in, you can expel it by blowing hard into the snorkel. The water then gets forced out through the purge valve and the top of the breathing tube. However, even then, a little bit of water always remains in the snorkel, which doesn’t prevent breathing but is a bit annoying. So if water gets in, the best approach is to stop swimming, release the mouthpiece above water and let the water flow out. If water gets in right before inhaling, you won’t be able to blow into the snorkel to expel the water and you risk inhaling it and choking. Your best approach, in that case, is also to stop swimming and let the water flow out. 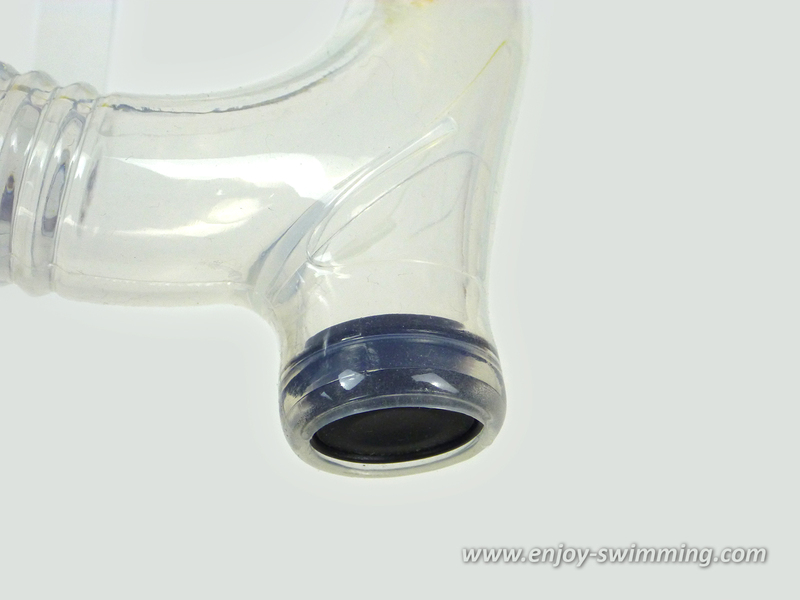 Another problem you might experience while using the swim snorkel is that you inhale water through the nose. I don’t have this problem, but a friend of mine does and he has to use a nose clip while using the snorkel. It seems this depends on the anatomy of your sinuses. I hear flip turns can be done with the snorkel but I haven’t tried yet because I’m not good at flip turns. Kicking sets: When using the snorkel to do kicking sets I can kick in a comfortable head-down position and kick very hard because I get as much air as I need. I just extend my arms forward and don’t need to use a kickboard. On the other hand, when doing kicking sets with a kickboard and without a snorkel, I need to put my head in the water because otherwise, my legs sink. And to breathe I need to raise my head. So in this latter case, I can’t breathe as often and I get exhausted more quickly. So the snorkel is clearly a plus. Learning the Front Crawl: The snorkel is also a good learning tool for the front crawl. It allows you to practice the horizontal body position, arm movements and flutter kick without having to be concerned about breathing. Once those basics have been internalized, rolling on the side to breathe can be introduced. 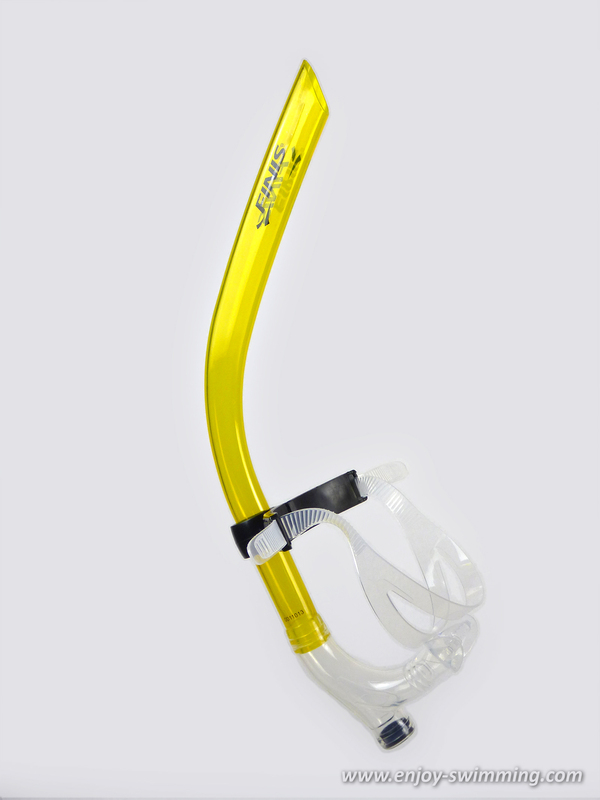 The snorkel can also be used for specific swimming drills, for example Head-Lead Side Balance, Under Switch, Head-Lead Body Dolphin, etc. Swimming Laps: I have mixed feelings about using a snorkel to swim laps. For beginners, it allows them to focus on particular aspects of their stroke without having to deal with breathing, which helps. I also hear that swimmers with neck or back problems are quite pleased with a snorkel, as they don’t need to turn their head to breathe and experience less discomfort. But in my case, using a snorkel restricts my technique. First, because I tend to look more forward when using a snorkel, my legs have a tendency to drop if I don’t pay attention and as a consequence, it can lead to a suboptimal position in the water. Secondly, I find that using a snorkel restricts my ability to roll my body left and right during the stroke cycle, I have to swim more “flat” if you will. As a consequence, I cannot fully engage my chest and back muscles and I have to pull more with my shoulders, which I find straining. To sum up, it depends on your particular circumstances if swimming with a snorkel makes sense. The snorkel doesn’t need much care. Just rinse it with fresh water after use and let it air-dry, as you would do with your swim cap and swim goggles. 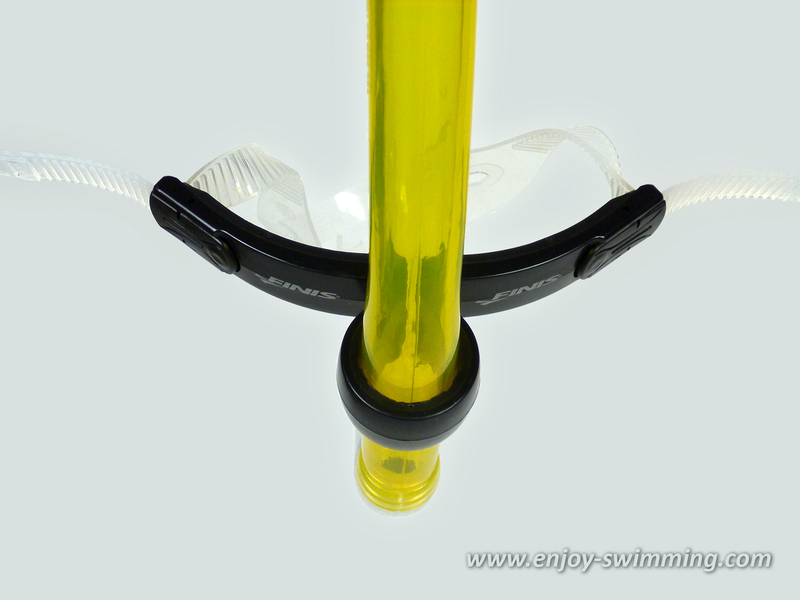 The swimmer’s snorkel is a nice addition to my swim bag and has made kicking sets tolerable if not enjoyable. For beginners, it can be a useful tool to learn how to swim, to practice swimming drills and even to swim laps. I just purchased one of these and I’m learning how to use it. I started by just floating on my stomach with my arms and legs straight out. I just breathed normally through my mouth and exhaled through my nose. It took a little while to feel comfortable with it. I then tried kicking off from the side of the pool and glided towards the other end, again breathing through the snorkel. I then added leg kicks. After a few transits of the pool, I tried adding arm strokes. Here, I had to fight the urge to turn my head. Recently I started having issues with “swimmer’s ear”, and I started using earplugs. The issue could really be water up my nose, as they are connected. I’m still not sure whether it’s better to exhale through your mouth or your nose while using the snorkel, but clearly, if you need to use nose clips you don’t have a choice. So far I haven’t had any issues with having to clear water from the snorkel during breathing, the purge valve seems to be doing it’s thing correctly. The snorkel really comes into its own when I’m swimming against a tether cord (my pool is less than 35′ long), I need to keep up with this to build my endurance. Thanks for this detailed post. I only wish the instructions provided with it had been this informative! I’m new to swimming for fitness and using proper technique (I grew up with lots of swimming in a lake but no swim lessons so I am comfortable in the water but have a lot of poor technique). I also have not done any cardio in far too long and so I get winded very easily. What I have found is that trying to swim even very slowly and learn to breathe properly during front crawl is almost impossible for me at the moment. I feel like my cardio fitness is currently too poor and I have to breathe too much. Would this be a good situation in which to use a snorkel? To allow me to get my heart rate up and get conditioned enough to be able to breathe a little easier at that higher heart rate before adding in proper breathing technique? Thanks so much for making this site! It has such a supportive and non-judgemental vibe to it, it’s been a great resource for me already! Being able to swim crawl even slowly is not so much a matter of fitness as a matter of technique. A snorkel can help learning the arm stroke and leg kick because you don’t need to be concerned about breathing. But to properly learn all aspects of the stroke and to be able to swim in a relaxed way the best is to follow the swimming exercises proposed on this site. 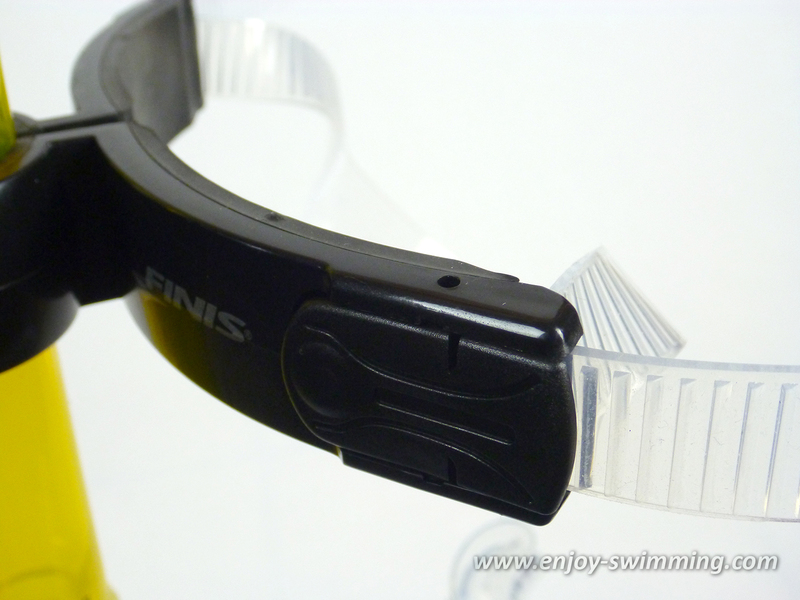 I have used a Finis’ swimmers snorkel for about two years. Great time. The last one I purchased lets water into the purge valve. To make sure, with mouthpiece and top of snorkel out of the water I put just the purge into the water and my suspicions are true. What a bummer.